Electric Augers like the Strikemaster 40V Lithium have come a long way. Head to any outdoors retailer in search of an ice auger, and you’re likely to be confused. Colors of red, black, yellow, and green, each with several powerheads to drive a spinning bit, of which there are also several variations. All of it just to cut a simple hole in the ice from which to fish. For those that think this is overkill, I would agree, but also should point out that each of these features may directly impact the way you fish. As part of a two-part series, I’ll deconstruct the powerhead, auger, and blade portions of your ice-cutter, then reassemble them in Part 2 to help you find an auger perfectly matched to your style of fishing. Electric Powerhead – Electric is the rage, and for good reason. No gas or exhaust fumes, and no carburetors to fuss with. That said, be honest with yourself and how many holes you cut. If the answer is more than 50 in thick ice, you’ll be needing either the latest and greatest Lithium-powered auger offered, or end up going straight to Gas and Propane models. If you live in the northern portion of the ice belt, consider ultra-thick late-season ice should you fish during those times of the year and again, go right to the other powerhead option. Gas/Propane Powerhead – Gas powerheads are still the most common and longest running product lines out there, because they work well. Longevity here is due to plenty of engine tinkering over the years, as well as the fact that gasoline does a great job of providing the appropriate compression to power a transmission that spins a large metal bit. Propane offers many of the same attributes on the cutting end, with the benefit of low or no exhaust, yet is a less efficient means of achieving that same combustion. That simply means you’ll use more propane to achieve the same results, though it may be worthwhile if you’re looking for gas-like power through thick ice with low exhaust. Auger – Nearly all auger bits are metal, mostly because it has proven difficult over the years to mount metal blades on a flexible surface while still maintaining their ability to cut ice. This can work for blades that don’t require a specific pitch or angle of attack to cut efficiently, but most of the quick-cutting options out there these days are metal. Of course metal is much heavier, so there’s a tradeoff between weight and speed that you’ll have to choose between. Sizes can range from 4”es to 10”, but spinning more auger bit, moves more ice, and thus requires more horsepower. Blades – I’m of the opinion that blade styles should drive the largest portion of your purchasing decisions, and here’s why; of the 3 main blade styles out there, each does something far better than the other. The chipper style blade is a serrated, angled blade that’s been around for quite some time. It actively crushes and breaks the ice as the ice auger rotates downward. This design has a number of advantages because of that pulverizing action, first and foremost being that it re-drills old holes with ease. There’s no bouncing or jarring break-through when going back into a permanent that’s had frozen-over holes for two weeks, but because of the torque and crushing force required for this blade to auger ice, they tend to have gas powerheads atop them. Still, they have a dedicated following, as the blades can be easily filed for sharpening, and are nearly bullet-proof, even when hitting sand or other debris on the ice. Flat-style blades have also been around for some time, though almost primarily on hand-augers. While they are curved along the length of their cutting edge, they sit almost flat against the ice, hence their name. As a general rule, they cut rather inefficiently, which is a real problem with thick ice when human-powered. That said, when spun fast enough on a power auger, either electric or gas, they provide a medium cutting speed and can also redrill old holes, though not as well as a chipper style blade system. This hybrid style of blade systems has come back and gained in popularity when paired with electric augers. The last cutting system is a shaver-style blade. It is curved, both along the long edge, and short edge of the blade, as if someone grabbed both ends of the blade and twisted in opposite directions. They’re often serrated, and lazer-sharp, relying on cutting angle and a precise pitch to shave and slice in a true corkscrew fashion. They are by far the fastest cutting system, whether as a single-piece end bit, or with replaceable blades that typically require professional sharpening. Those blades are precision cutting instruments that shave the ice, but do so aggressively, allowing the auger to drive deeper with each successive turn. That said, the edges carved out make re-drilling old-holes a bit trickier than with the other systems. To re-drill old holes with a shaver-style blade, you need to only proceed until water appears. At that point, stop turning the bit, and simply lift up. Continuing down and under the ice makes the edges of the auger flighting catch on the way up, and can create difficulty in pulling it above ice. They’re also a little bit touchy when it comes to hitting debris or sand on the ice, so carrying replacements is a good idea. In part two, I’ll describe a handful of anglers and what pairings match best to specific situations on ice. While no one auger can do it all, the goal is to best suit the majority of icescapes you encounter. Now that you know not all augers are created equal, it’s time to provide some common ice fishing situations, and prescribe the right ice auger for the job. Of course, there will always be variations to your fishing, in terms of everything from location and species, to ice thickness and the shelter you fish in. If you’re going to settle on a single auger, you’ll likely need to put up with some of the inconveniences which certain powerhead, auger bit, and blade combinations create. All of which we’ve been doing for years without even really knowing it. That said, just as with different fishing rods, specialized tools can make any job more enjoyable. Panfish-Only Anglers – It’s surprising to most anglers, but there’s few panfish, even exceptional trophy panfish that won’t fit through a 6” hole. Most will fit through a 5” hole. Why go so small? Because it’s simply easier to drill more holes, faster, and with less effort than with larger auger bits. For finicky gills and crappies, more holes can really make all the difference, such that have a large, heavy auger can not only require more time to drill the same amount of holes, it can prevent you from drilling more and finding more fish. To me, the perfect panfish rig is a 6” shaver style blade and auger bit system, with a trusty electric power source of your choice on top of it. 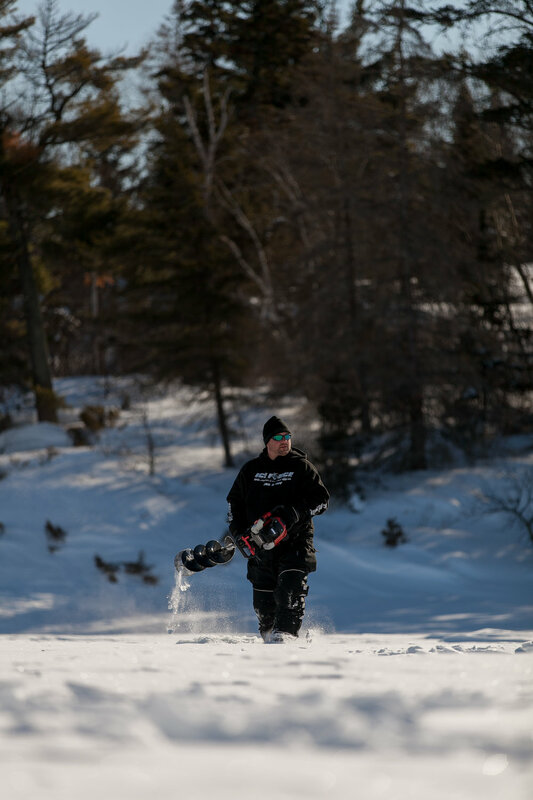 Southern Style – If you live in the southern portions of ice territory, consider a hand auger, but make sure it has the shaver or lazer-style blades. You’d be amazed at how fast they’ll cut 4-8”es of ice, and chances are if you’re living here, you might not cut much ice in a season anyway. This is a cheap way to make short work of ice, and step light while doing it. Predator Chasers – If you chase big pike and lake trout, you’re somewhat committed to a 10” bit. Also, because of the locations of these fish, you’re probably looking at thicker ice than usual, and a gas or propane powerhead will be required to turn those larger bits. Some of the beefier electric units out there will spin such bits, but depending on how much ice and how many holes you’re cutting, you might be wishing you had more reserve run-time. As far as blade-styles, you’re probably cutting a new hole each time, so the shaver styles will cut them faster and with less effort. Wheelhouse Crowd – For anglers in a wheelhouse, fumeless is the way to go, as you’ll be occupying that same airspace for some-time after the holes have been drilled. While there is the potential to re-drill old holes in the most extreme of circumstances, Wheelhouse anglers are typically pulling their house off the lake after each trip and relocating to a different lake or area each time. In that respect, the advantage goes to a shaver-style system with a heavy-duty electric powerhead on top. This allows you to move a few times per day even, as well as drill tip-up or extra scouting holes outside of your shelter without running out of battery power. Consider the flat-style or hybrid blades should you keep coming back to the same wheelhouse day after day, weekend after weekend. As for auger size, 8” or 10” is standard, with some anglers preferring a 10” hole because it freezes out slower, and other anglers preferring an 8” hole because fish have a harder time turning around inside of it and swimming down. Permanent Dwelling – If you re-located only a handful of times per year, your number one consideration should be re-drilling old holes. While a chipper blade system will perform best here, few chipper systems exist on any platform but gas augers. If the fumes bother you, go with an electric powerhead and flat-style blades. If you’re split on the matter, utilize a propane powerhead with the chipper systems available for the easiest hole re-opening and relatively few fumes. Portable Patroller – For the angler that roams the open ice sheet, drilling to the ends of the horizon, the ultimate ice auger is gas-powered with shaver-style blades. Nothing cuts easier, faster, or longer than this combination in a standard 8” size. That covers almost all bases, and will serve you for about any ice situation without feeling like performance is a problem. As I’ve written previously however, the new electric systems are seriously pushing the limits of what your mobile angler of today needs. New Lithium powered models that punch hundreds of holes in a foot of ice will serve the vast majority of even the most auger-happy angler. For the northern portion of the market however, you’ll be wanting gas from February forward, especially if you’ll be needing an auger extension as is common in that part of the ice belt. If you don’t fit any of these categories, I’m positive that by now you know enough about each feature and its attributes to build your own perfect machine. What’s more likely is that you fit several of these categories at once. At which point you’ll have to choose either what’s the most common type of fishing you do, or purchase another auger to serve the other end of your needs. Yet another option is to buy additional auger bits that feature a different size or cutting system, such that one powerhead can turn both. This is a great way to address a few situations at once, such that you’ll never be left needing more from your ice cutter.